In April 1956, construction began for a new high school in Selkirk to replace the previous Selkirk Collegiate building. Designed by the Winnipeg architectural firm of Prain and Ward, and built at a cost of $240,000, the frame, concrete, block, and brick-exterior facility contained ten classrooms along with a commercial room, laboratory, and auditorium. When classes began in September 1956, initial enrollment was 218 students, and the new building was occupied around October of that year. 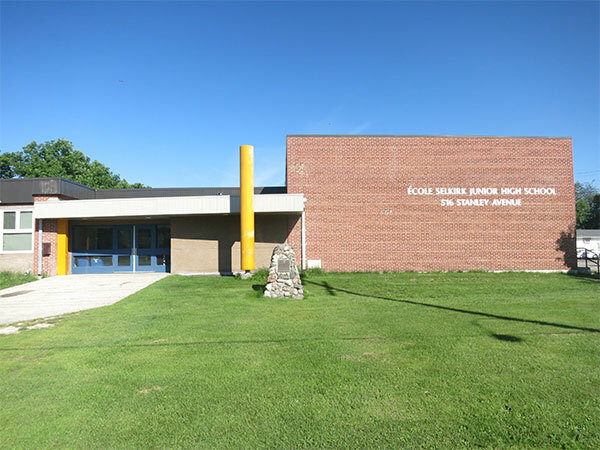 In 1971, high school students moved to the newly-constructed Lord Selkirk Regional Comprehensive Secondary School and this building became a Junior High School. A monument on the school grounds was built between 1966 and 1967 by the staff and students of the Selkirk Collegiate Institute to commemorate Canada’s centenary of Confederation. “Vote for school,” Winnipeg Free Press, 31 December 1955, page 3. “Tenders - New Selkirk High School,” Winnipeg Free Press, 20 March 1956, page 31. “218 enrolled as new collegiate opens in Selkirk,” Winnipeg Free Press, 8 September 1956, page 52. “Selkirk teacher goes to bat for teenagers” by John Clayton Stewart, Winnipeg Free Press, 13 April 1957, page 40. “Vocational teachers required,” Winnipeg Free Press, 2 June 1970, page 54.